As with any job (couponing isn’t just a hobby! It’s a way so many of us keep our families running!) there are tools of the trade. Thankfully many of the best couponing tools are FREE and online! Here is a roundup of my favorites: Don’t forget to sign up for our e-club and get access to a FREE downloadable of the Coupon Tool – make your gorcery list! Coupon Database: Use this tool to search for coupons you need. 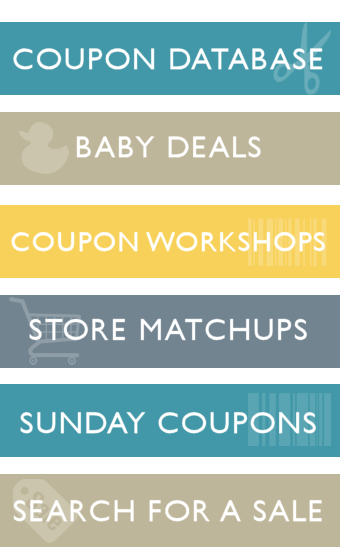 Printables or Insert- all the available coupons will show up exactly where they are. Expired Insert Checker: This tool allows you to check your inserts to see if they are safe to discard. Sunday Coupon Preview: Each Wednesday (or earlier) we post a preview of the upcoming Sunday Coupons! Sale Search: Search for sales by item or brand. Coupon Code Search: Shopping online? Always start here and look for a coupon code! Stock Up Calculator: Calculate how much of a product you need to buy to avoid running out and having to pay full price or buying too much and having it go to waste. Savings Calculator: Enter in your Out of Pocket Cost, the Original Cost and it tells you the percent savings! Stockup Price List: Know what an item is REALLY worth after coupons! Coupons: Print coupons at home! Document is asking for password to unlock protected sheet? I can’t put my numbers in unless I do this. The green columns are locked – if you try to type in there it will ask for a password. Use the grey columns! HOPE THIS IS THE HIDDEN PAGE. I WANT TO WIN. I want to win the HT gift card. Thanks for all of your great tools and tips. I am too guessing that this is the hidden image page.. I am hopeful this is the hidden image page??? Just wanted to thank you so very much for all your great tips, advice, and of course, help with couponing. I am fairly new to couponing and find your site extremely helpful!!! Thanks again!! I am also hoping this is the hidden image! I want to take just a moment to tell you Thanks for all you do. You have helped not only me but so many others with your help. I really enjoy going to your site and gathering all the information that you have it helps so much. Thank you so much! Searching for the hidden image!!! I’m hoping this is it! Hope I’ve found the hidden image!! Looks like it to meeee!! I hope this is the page to enter! Very well played my coupon mentor, very well played!!! I’m new to MoolasavingMom and have found your blog helpful and easy to use. Thanks for all you do to help us shop smart and save! Love the page, I’m always checking it for great deals!! Thanks for all the help on your site! Thank you for helping us save money. Is this the link for the hidden inage? Hope this is the hidden image!!! love to win!!!!! Hope this is the hidden image. Thanks!! Did you have a coupon calculator tool available at one time? I thought I saw a reference to the tool some time ago but now I can’t locate it. HI, I am using the Coupon Tool 3.1 and I am having a problem with my item box not being big enough to put the item in the spot. Shedd’s Spread Country Crock is too long, Dole Pineapple Chunks is too long, and so on… Can you tell me how to fix that or can you fix that and let us download the new tool? You may need to just shorten the text but we will have this put in as an update for the next edition. Instead of putting Shedd’s just put Country Crock or put Dole Pineapple, etc. I apologize. Can I download the coupon tool on my iPad & desk top to make my grocery list. I thought I was already signed up for the e-club but I guess not. Thank you so much for all you do. You are a blessing to the couponing community. I *think* if you have the pages it may work. I’ve never tried it though.